I posted a picture yesterday on Facebook and it asked the question, “what is one good thing in your life today?” I did a lot of thinking about that one since finding good things are hard for me right now. So, I posted that it was a beautiful day and I was alive. Those of you who know me also know I try to find good every day. It is so hard to do that right now and I went to bed last night trying to think of other good things I have in my life. i did come up with a few. First and foremost is my family – I don’t honestly know what I would do without them or where I would be or if I would be here at all. They are my lifeline and I love them all so much. I am truly blessed with this wonderful group of crazy people I call my family. My daughters, I can’t even begin to tell you how much they mean to me and what their love and support has meant when I know how much they themselves are hurting. My grandchildren, they give me a reason to go on every time I even just think of them. My nieces, they have been so loving and supportive and always ready to listen or help whenever I need them. And the rest of my family, I love them all so much. My friends – I really have a hard time putting into words how much my friends mean to me. I have always had great friends and I appreciated them. I knew those kinds of friendships don’t just happen and that I was lucky and so I always tried to be kind and be there for my friends. But it wasn’t until the recent loss of my son that I truly learned the value of real friendship and just how much of a difference it can make in your life. True friends don’t need to be asked, they are just there, to support, to help, to talk, to just listen. My health – I am so very grateful for the good health I experience. I know so many others who aren’t as blessed and I wake up every morning and give thanks. My writing – I can’t begin to tell you how much writing means to me. I honestly don’t know where I would be if I couldn’t write about my feelings and get them out. I love writing and love how all of you have embraced my doing it! Thank you to everyone of you who read my blog and those who share it and take the time to comment. It means the world to me. 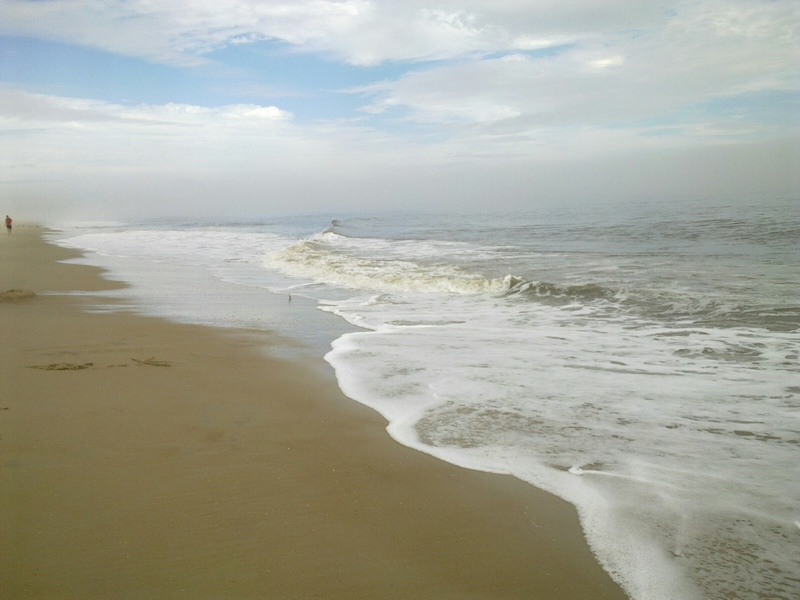 Trips to the beach – I just had a quick 2 day trip to the beach this past weekend. Every time I go it brings me so much JOY! I love just sitting in my chair and watching the ocean. Also the smell of the beach and sea air somehow calms me and gets me ready to face whatever lies ahead… or deal with whatever has already happened. Reading – I have always loved reading. But lately I have been reading nonstop. One book after another. It gets me out of my head. I don’t think about anything else but the book I am reading at the moment. This can sometimes be a bad thing since I can’t stop and wind up reading into the wee hours of the morning. But I love it. I will at some point do a post on some of the really good ones I have read this summer. Doing things with my grandkids – even if 3 of them are living in another state, far, far away I get to see them quite a bit and love doing things with them and all 5 of my grands. We go on hikes or to interesting places(sometimes, they don’t think they are as interesting as I do). Taking them to the kids movies that are out is so much fun for me. I guess it would kinda of be weird going to see those movies alone so I have a good excuse to see them. And the 3 that live in another state, well we FaceTime when they aren’t here visiting. It is almost as good as having them here with me…almost. Going places with my daughter. We have a lot of the same likes, we also have a lot of differences…LOL, but we enjoy going on road trips, concerts dining out and shopping. I enjoy spending time with her and finding fun things to do. I love when my daughter that lives far, far away comes for a visit and we do things together or if we go visit her and get to have a girls day out. We used to go to plays together in DC, but since she moved we haven’t been able to and I do miss that. Lunch or dinner with a friend/friends – Nothing better than a get together with a group of friends over some food and maybe a glass or two of wine or a margarita. The laughs and stories are enough to keep me going for a couple days. And again the support and love I feel is always there. And finally..Me! I am good! I am not whole or wonderful by any means, but I am good… I am somewhat broken and some days it is all I can do to get out of bed and put on clean clothes. But I am here, I am alive and I am doing the best I can. I leave you as always with a question and a quote. What is one good thing in your life right at this moment?